You are always promised something truly unique when Cartier release a new high jewellery collection. This Coloratura collection does not disappoint. It completely affirms Cartiers vision of style, reinventing some traditional pieces for the modern day wearer. I was enamoured with the collection from the moment I saw it. Not only the vibrant colours of the stones, but the colour ways are so original its like nothing I’ve ever seen before. Coloratura is a word mostly associated with Opera singing. Describing how an operatic singer would elaborately perform a vocal melody. The Italian word, when used in English, literally meaning ‘colouring’, perfectly describes the way a singer would add trills, runs and wide leaps within their melody. It such a dynamic word, that I can almost imagine the sound of it in my head. A sound of a soprano reaching such wonderfully high notes is incredible, however when a singer can add a little Coloratura to a repertoire it add that little something special, even magical, to the piece. I think then so aptly Cartier have used it to name this collection. It’s that little something extra, a little unexpected, that astounds you. 1. 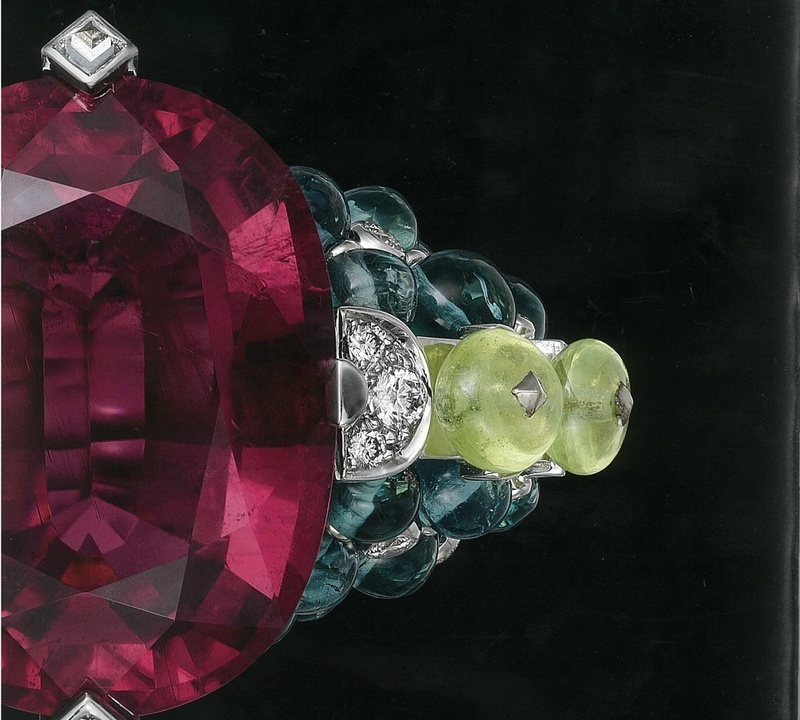 Holika Ring by Cartier – White gold, one 15.05 carat cushion-shaped rubellite, blue tourmaline beads, chrysoberyl beads, square-shaped diamonds, brilliant-cut diamonds. I’ve always adored the colour Red. It’s such a intense colour and has long been used by Emperors and Warriors clothing as it exudes such power when worn. It’s also associated with passion, love and desire. When presented with a red Cartier box, you subconsciously know that you had been given something of great value and significance. Red has been used by Cartier throughout its great history and thanks to their strong connection to Indian princes, they have designed and created some of the most beautiful pieces of jewellery with the precious stone, Ruby. 2. 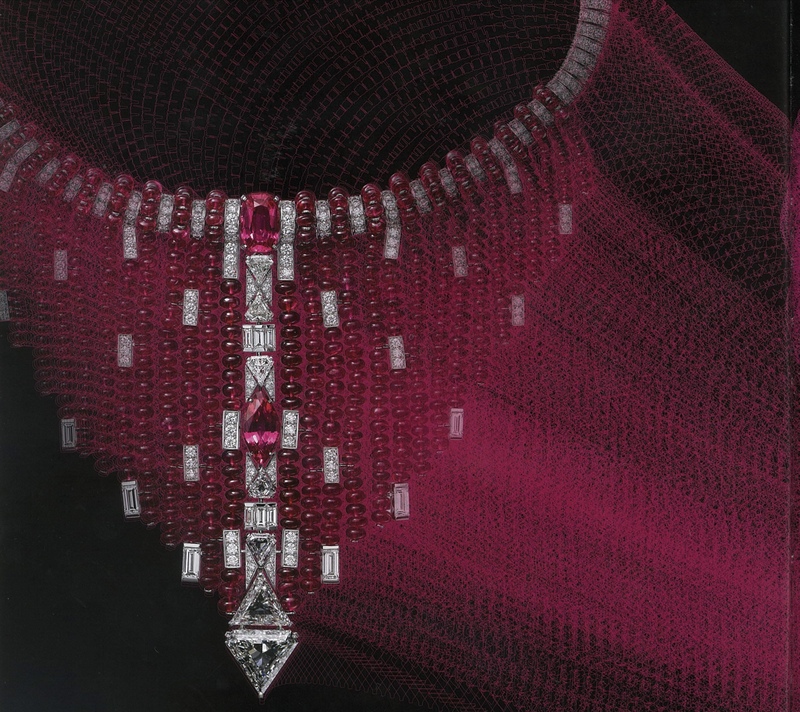 Kanaga Necklace by Cartier – White gold, two orangey pink spinels totalling 7.58 carats, two triangular-shaped step-cut diamonds totalling 8.39 carats, spinel beads, modified shield-shaped, kite-shaped, baguette-cut and brilliant-cut diamonds. The Kanaga Necklace is the most stunning cascade of spinels with intermittent flashes of white diamonds. I can feel the sublte inspiration of an African princess, as I imagine myself wearing it overlooking the great Serengeti as the sun sets. It really evokes a lot of energy and passion. 3. 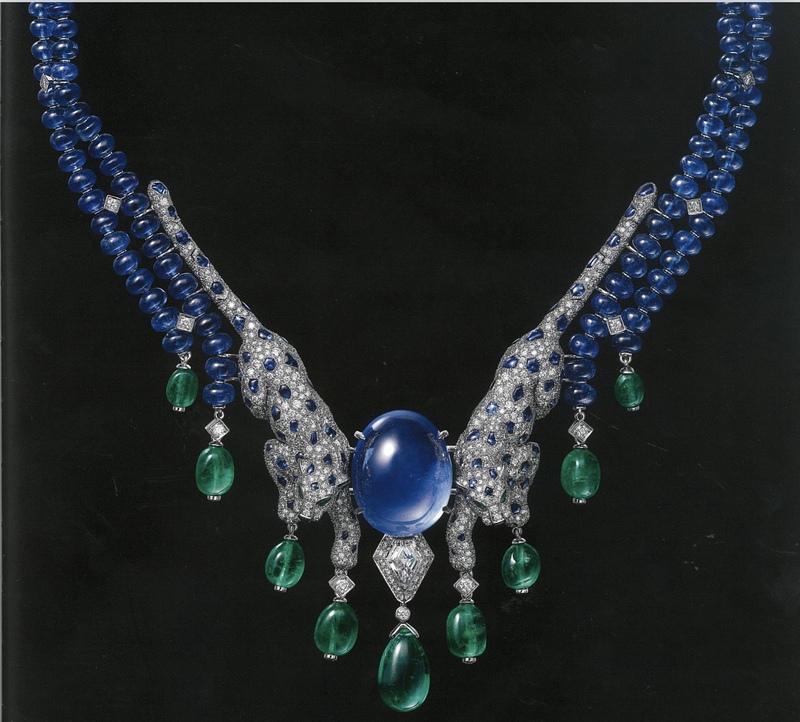 Panthére Impérieuse Necklace by Cartier – Platinum, one 41.06 carat cabochon-cut sapphire from Ceylon, one 5.14 carat emerald drop from Zambia, one 0.92carat modified shield-shaped step-cut diamond, emerald drops, sapphire beads, sapphires, emerald eyes, onyx, brilliant-cut diamonds. I love the calm and serenity of the combination that green and blue create. I think together they symbolise harmony, the earth and the sky. A happy and content pairing. The freshness of lusciously green grass and the awesomeness of a bright blue summer sky. One cannot simply exist without the other. I find this terribly romantic. The wonderful different shades of blue the great Ocean can create, from the deepest blue to crystal clear azure. I do find blue to be very balancing and good for the soul. 4. 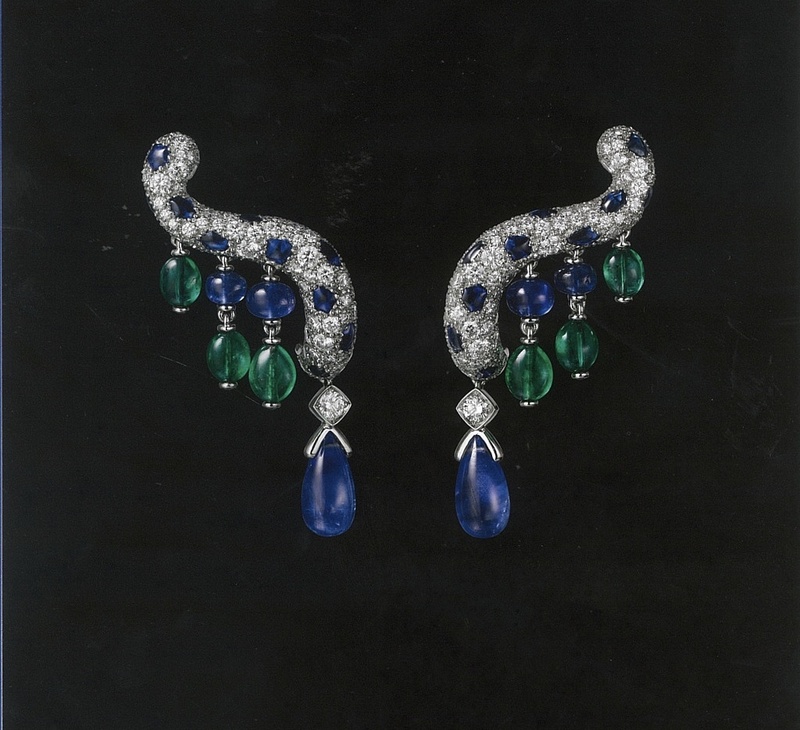 Panthére Impérieuse Earrings by Cartier – Platinum, two sapphire drops from Burma totalling 4,70 carats, emerald and sapphire beads, sapphires, brilliant-cut diamonds. The Panthére Impérieuse Necklace and earrings are simply breathtaking. The earrings consist of two sapphire drops from Burma. Designed with brilliant cut diamonds, emerald and sapphire beads these truly are remarkable. The Panthére Impérieuse Necklace showcases one cabochon-cut sapphire. I think this is the most dazzling of pairings, worn together would ensure all eyes were on you. 5. 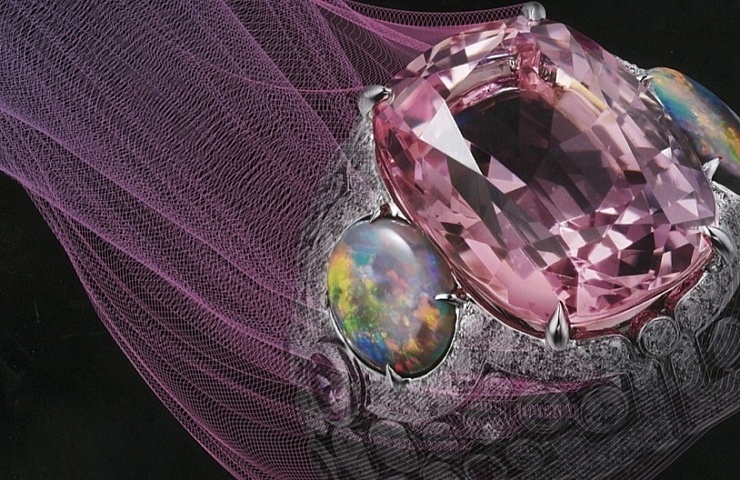 Matsuri Ring by Cartier – Platinum, one 26.20 carat cushion-shaped tourmaline, onyx, brilliant-cut diamonds. The pairing of green and black I think makes an elegant, yet moody duo. For many years these colours were not used together as black was deemed to dark to be paired with the youthfulness and freshness of green. However in later years painters saw the beauty in the purity of blackness combined with the allure of green. I think these colours are effortlessly chic and really luxurious when paired together. They make me think of the deepest black velvet and the most vibrant green, truly beautiful. 6. Amravati Necklace by Cartier – Platinum, one 50.44 carat carved emerald from Zambia, two carved emerald drops from Zambia totalling 71.11 carats, one 10.16 carat carved ruby from Mozambique, carved rubies, sapphires and emeralds, sapphire and emerald beads, onyx, triangular-shaped diamonds, square-shaped diamonds, brilliant-cut diamonds. The Necklace can be worn in four different ways. The Amravati Necklace is an exquisite masterpiece. 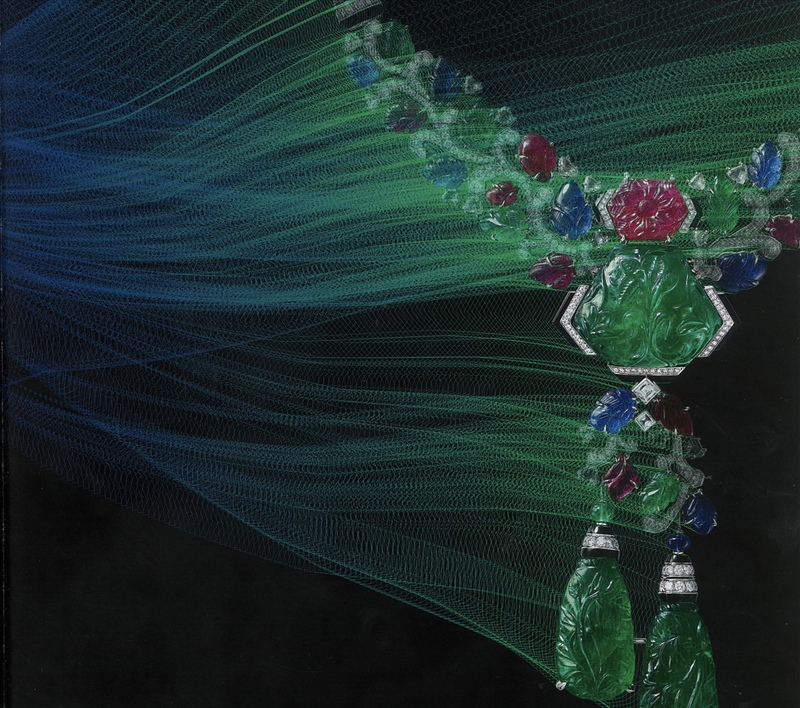 One intricately carved emerald from Zambia take centre stage of this Necklace. 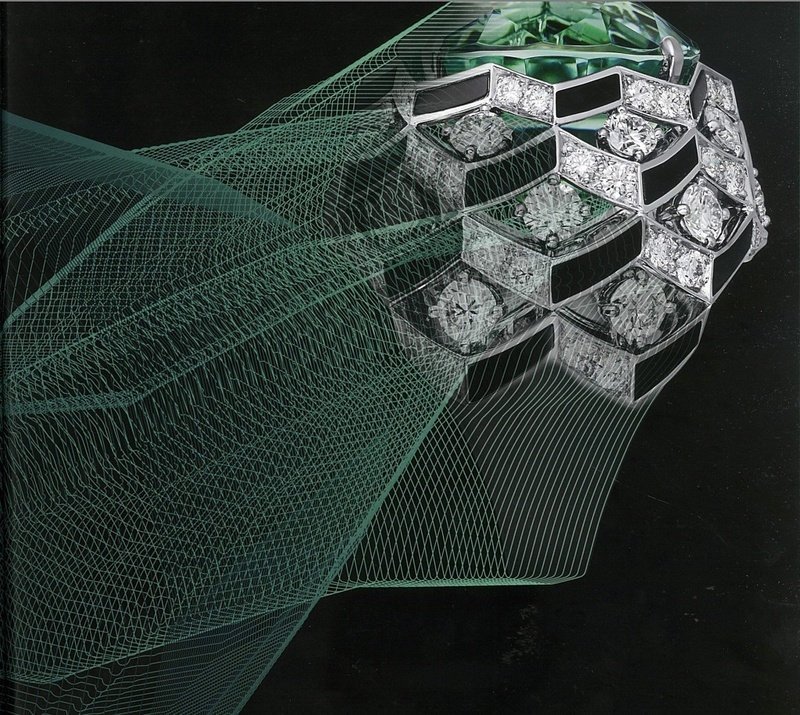 Encased by diamonds and onyx makes the emerald really stand out. 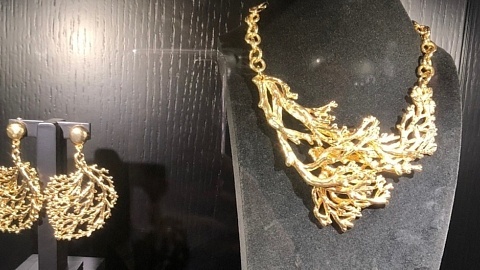 This piece really showcases the talent of the Cartier team, a truly unique design that you would treasure for a lifetime. 7. 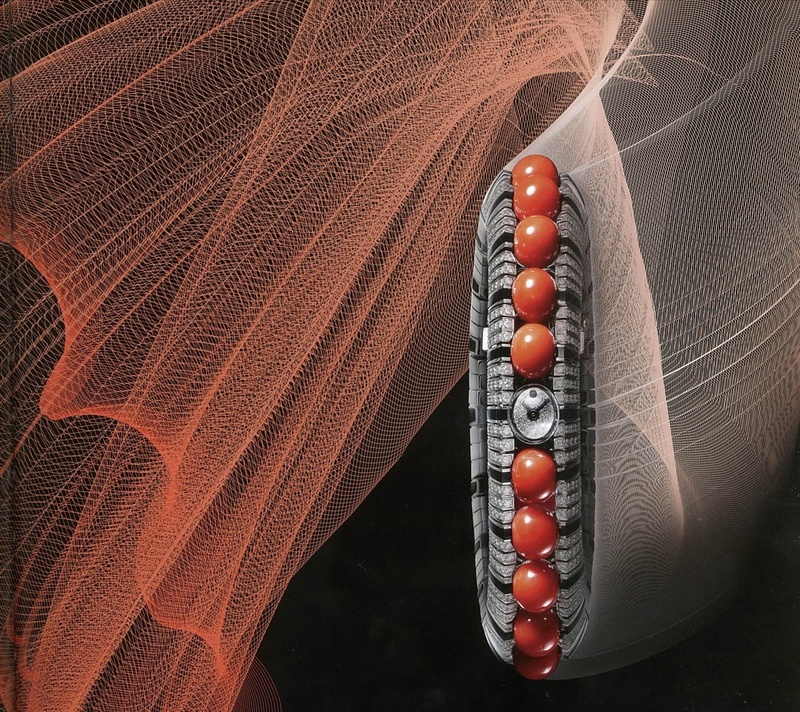 Orienphonie Wristwatch by Cartier – White gold, nineteen orangey red coral beads totalling 130.46 carats, onyx, brilliant-cut diamonds, quartz movement. I love how the calming nature of green can soothe a fiery red. This is the colour-way of the yin and yang, seemingly opposites may actually be complimentary. Individually both strong colours, yet somehow they have a mutual adoration for each other. I think green and red are a rich, powerful and energetic duo. 8. 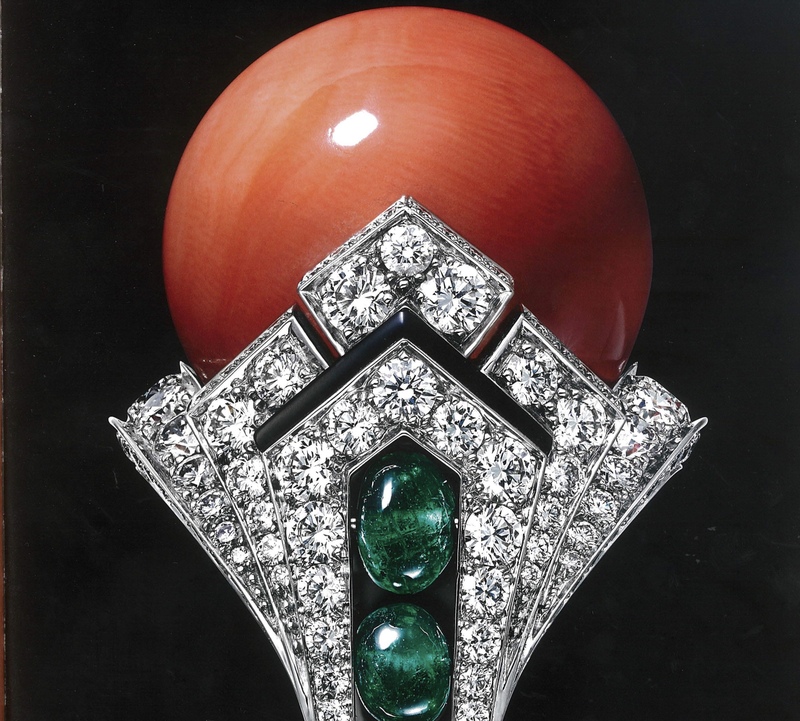 Mavra Ring by Cartier – Platinum, one 35.00 carat orangey red coral bead, cabochon-cut emeralds, onyx, brilliant-cut diamonds. The Mavra Ring is spectacular. I am in love with the Art Deco-inspired setting holding a dazzling orangey red coral bead. The emeralds, onyx and diamonds are sensational next to the ravishingly red coral. This is the ultimate in cocktail rings. I can just imagine sipping on a Martini partying the night away at an infamous Gatsby party in 1920’s New York. Credit : Coloratura Collection by Cartier.